Marketing refers to the activities of the organization associated with promoting and selling of its products and services. It includes advertising, selling, delivering products to the customers, and market research. In fact, it is everything which the organization does to acquire customers and maintain a relationship with them. An efficient marketing cultivates sound business strategies, allows for successful innovation, increases the effectiveness of promotional strategies, and strengthens the brand image. The main purpose of the marketing is not only to maintain the relationship with existing ones but also to attract new customers. The process of interaction between the marketing men and the customers presents the dialogue between them and assumes the exchange of values. Marketing plan is one of the major and extremely significant of the organizational business planning process since it is the marketing which brings success in the long term, particularly, continuous growth in the earnings of the organization. Marketing plan has an input in defining efficiency in customer satisfaction terms. It also helps to identify core products/services which meet the needs of the target segments of the organization. For understanding the theory related to the marketing and the marketing plan it is first necessary to understand its elements. These elements are (i) marketing mix, (ii) branding strategy, (iii) competitor and market analysis, (iv) customer decision making process, and (v) sales plan. Marketing mix is a theoretical framework which defines four indicators in arranging the offerings to meet the needs of the customers. These indicators are (i) product, (ii) place, (iii) price, and (iv) promotion. These indicators are also known as 4 Ps. The concept of 4 Ps is considered to be powerful due to the reason that it makes marketing process simpler and allows having a precise control of the process. Marketing mix is a set of techniques which is used to market a brand and improve the competitiveness. 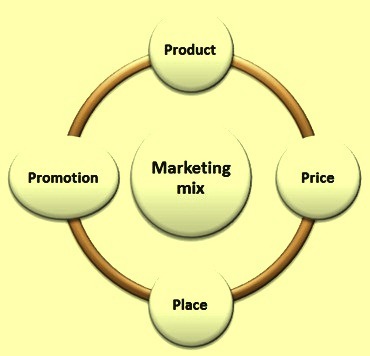 The marketing mix concept is shown in Fig 1. The first component of the marketing mix is the ‘product’. Product represents goods or services as well as variety or range of products which are produced and offered to satisfy the needs of the customers. The product policy includes a large number of activities such as design, packaging, labeling, and after sales services. Product has a lifecycle which has four phases consisting of (i) introduction phase, (ii) growth phase, (iii) maturity phase, and (iv) declining phase. Each of the phases brings different revenues and expenses at some point. Fig 2 displays how revenue and profit are changing in each of these four phases. 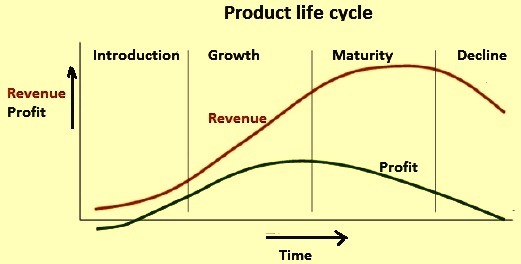 It can be seen from the Fig 2 that the profit reaches its peak in the growth phase, while the biggest amount of revenue is being achieved in the maturity phase. The organization is to aim to search for the possibilities and the opportunities to extend the life cycle of the product. It is also to ensure that there is the right product for the right market. In addition to this, the organization has to have a number of products in its product mix. This diversification of the product mix ensures that there are always some products of the organization which are either in growth or maturity phases. This ensures stability in the generation of revenues for the organization. The second component of the marketing mix is the ‘price’ which reflects how much product or service fetches revenue for the organization. The price is an important component of marketing plan since it determines the profit of the organization providing the other expenses for producing and marketing of the product remains constant. Price has a significant influence on the whole marketing strategy, sales, and demand of the product. It reflects the thinking of the customer towards the product. Low price can mean lower quality of the product while the high price can outbalance the benefits. Price depends on several factors such as market competition level, the position of the organization in the market, and aspects concerning the macro-economics. The economic development of the market plays a major role towards the purchasing power and the demand. The process of pricing the product requires the knowledge about the price offered by the competitors as well as the analysis of the value of the product for the customer. Value of the product means the utility of the product for the customer as well as the expectations of the customer from the product. While analyzing, it is important to remember the socio-economic and cultural aspects of the geographical region since it differs from place to place. Hence, the price of the product normally varies from place to place. ‘Place’ is the third component of marketing mix. It represents the location of the sales point and its accessibility. The component of place needs a deep analysis of the target market so as to identify the best distribution channels and efficient positioning. Improper analysis of the place component can lead to the bad results. The distribution strategy cannot be the same for all the regions. The proper analysis of the place component clarifies such issues such as (i) the preference of the customer with regards to the product storage, (ii) option of direct delivery to the customer from the production plant, (iii) the strength of the sales manpower required, and (iv) the difference of the distribution strategy with that of the competitor. The fourth component of 4Ps is ‘promotion’. It represents the strategies towards the product promotion to the consumers (e.g. advertising). It is considered to be an important part of marketing plan as it can increase the sales because of increased recognition of product brand. The usual channels of promotion have such tools as advertising thorough television, Internet, radio and print media. Sales promotion can also be carried out by offering different kind of incentives to the customers. In addition to these, various other public implements such as events and conferences, press releases and exhibitions are efficient tools for product promotion. The very important aspect in promotion is the behaviour and the attitude of the marketing personnel. This is because marketing personnel are front line executives since they deal with the customers frequently on a regular basis. Their decent behaviour and attitude project to the customer a positive image of the organization. Hence tracking of the behaviour and attitude of the marketing personnel is important with regards to the product promotion. For the product promotion the organization is not only to consider the target market, but also the target groups in the market since different target segments have different preferences for the communication. Further, the time of the promotion has a big influence on the absorption of the information by the target segment. However, advertising is not the only method for the product promotion strategy. Sale offers also play a big role in the product promotion since potential customers are attracted towards the product, if the customer finds the offer beneficial to him. Branding strategy for a product is a long-term plan of the organization for the development of brand for its products. Brand is intangible asset which creates an image of the organization. It plays a very important role since it tells the customers what to expect from the product or service. It also displays to the customer in what respect the branded product differs from the product of the competitors. Branding of the product can be carried out through logo, name, and slogan as well as through other visuals which are representing the brand of the organization. Effective branding strategy improves all the business areas of the organization, improves the competitiveness, and has a positive effect on the customers’ experience and emotions. Once the work on the development of the branding strategy has started, it is necessary to first define the target groups, competition level of the market and 4 Ps for moving in the right direction. For achieving strong brand equity, it is also necessary to define precise purpose of the business and to ensure that the messaging is consistent with the brand strategy. Branding strategy can be considered to be efficient if an effective communication method is used for a target group to reflect the brand. Further, powerful branding strategy needs development of the brand around the emotional benefits. If customers feel that they are the part of the larger group, it strengthens the relationship between the organization and the customers which also improves their level of the loyalty towards the organization. Branding strategy includes the improvement of visibility and reputation to increase the level of recognition of the brand and the trust of the customers. Further, the branding strategy needs to be consistent, so that it remains flexible. Brand flexibility is important since the brand can be adjusted to the preferences of the market, competitors and customers which are generally changing with the time. Flexible branding strategy helps the organization in maintaining a stable position in the market despite change in the environment. These days there are normally several competitors in every segment of the market which throws up many challenges for the organization. In order to have a better performance and higher customers’ loyalty than that of the competitors, it becomes essential to carry out the competitor analysis. The competitor analysis is an integral element of the marketing plan since it identifies strengths and weaknesses of the competitors as well as predicts their possible actions. This evaluation helps the organization in making its products or services unique, thus increasing its market share. It also helps in the identification of the new opportunities for the organization in the market. There are three types of the analysis methods which are normally being used. These are (i) Porters 5 forces analysis, (ii) analysis of a particular competitor, and (iii) SWOT analysis. These analysis methods are described below. 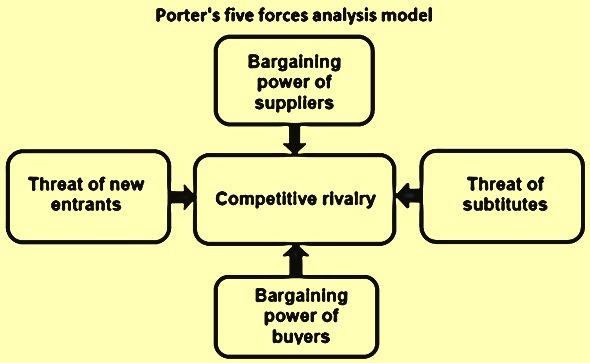 Porter’s 5 forces analysis – Porter’s 5 forces analysis model is a tool which analyzes the competitive intensity within a particular market or industry. This analysis consists of 3 forces from the horizontal competition representing (i) threat of new entrants, (ii) threat of established competitors which is also known as competitive rivalry, and (iii) threat of substitute products/ services. The balance 2 forces are from vertical competition represented by (i) bargaining power of the buyers, and (ii) bargaining power of the suppliers. Horizontal competition means that these 3 forces are operating in the same manner within the market and in the vertical competition the 2 forces operates within the supply chain. Moreover, the model displays that four forces are connected to the fifth one which is the competitive rivalry. Fig 3 shows the Porter’s 5 forces analysis model and the relationship among its components. The competitive rivalry is about differentiating competitors and understanding of their actions and market strategies. Some analysis tools are used for the evaluation of the competitive rivalry. These are ‘concentration ratio’ (CR) and ‘Herfindahl – Hirschmann index’ (HHI). CR displays the market control of the particular organization through measuring the total output produced by a number of organizations. HHI shows the size of the organizations with comparison to the market and the level of competition between them. The competitive rivalry is normally influenced by (i) pace of market growth, (ii) amount of fixed and storage costs, (iii) level of product differentiation, and (iv) entrance/exit barriers. In order to protect and extend the market share, the organization needs to take such actions like pricing policy, constant product innovation and differentiation as well as big advertising and promotional campaigns. The force named ‘threat of new entrants’ determines the quantity of the new organizations which may enter the market. The number of possible entrants depends on several factors such as (i) existence of entry barriers, (ii) governmental policies, (iii) economies of scale, (iv) brand equity, and (v) customers’ loyalty. The analysis of these factors helps to predict the appearance of new competitors in the market and their future market share. The force named ‘threat of substitutes’ measures the potentiality of customers to switch to alternative products. The threat of substitutes affects the organization in terms of level of profitability. The factors, which are required to be analyzed in order to prevent the loss of customers, includes (i) customers’ preferences, (ii) price and quality of the product, (iii) availability, (iv) level of switching costs, and (v) usage’s performance. The force named ‘bargaining power of suppliers’ shows how suppliers can influence at the organization. Suppliers can set high prices and have some specific non-beneficial offers which can have a negative impact on the profit. There are practices which evaluate the power of suppliers such as (i) number of substitutes, (ii) cost of switching, (iii) supplier competition, and (iv) price sensitivity of the buyer. The force named ‘bargaining power of buyers’ evaluates the position of customers in the market. Some customers can have a strong power to change the price or the quality of the products. The bargaining power of buyers can be assessed with the analytical tools such as (i) number of organization in the market to the number of buyers, (ii) cost of switching, (ii) customer price sensitivity, (iv) products’ differentiation level and (v) the buyer information availability. In short, the Porter’s 5 forces analysis helps in getting an overview of the market environment and in defining the marketing strategy of the company. Analysis of the particular competitor – Porter’s 5 forces analysis gives an overall image of the market. However, if evaluation of a certain competitor is needed then more elements are required to be taken into consideration. These are (i) competitor profile, (ii) marketing profile, (iii) product profile, and (iv) financial. Personnel and facilities profile. The assessment of the competitor profile includes objectives (growth rate and market share, short- term or long-term goals), strategy (investments, innovation projects, advertising campaigns, and mergers and acquisitions etc. ), assumptions (idea of competitive position, and industry trends etc. ), capabilities (ability to adapt quickly to the changing conditions), and competitive advantage (what differs the competitor from the other organizations). Marketing profile evaluation includes assessment of target market, market share, customer’s loyalty, and growth rate. This profile also contains estimation of promotional strategies, network and distribution channels, pricing policies and sales campaigns. Product profile tells about competitor’s product, research and development activities, brand equity and loyalty, and patents. The last element of competitor analysis is looking at the financial, personnel and facilities profile. Financial profile includes the information about profitability, profit growth rate, liquidity, financial ratios, and cash flow. Personnel profile is about number of employees, their qualification and the management of the organization. The facilities profile consists of production capacity, number of plants, logistics, and investments in production. In short, this analysis allows having a full knowledge of the particular competitor and defines a strategy to have a competitive position on the market. SWOT analysis – SWOT analysis is an analytical tool which is used to identify and categorize external (threats and opportunities) and internal (weaknesses and strengths) factors. Organizations have a direct control over internal environment which is represented by the 5M methodology (men, machines, methods, measures and means) and three key concepts namely (i) technology, (ii) quality and management, and (iii) performance. On the other hand, external factors are beyond the control of the organization because of the reason that these factors are influenced by (i) political/legal factors, (ii) issues related to technology and economics, (iii) social/demographical factors, and (iv) level of the competition in the market. The SWOT analysis helps the organization to monitor its own performance and to create the competitive advantage. Within competitor analysis framework, SWOT analysis, which is completed for one of the competitors, gives an opportunity to forecast competitors’ strategy. This tool helps to achieve a stable and strong position on the market, constant growth and increase in profit through understanding of weaknesses and threats of the competitor and organization’s own strengths and opportunities. The elements of the SWOT analysis and its explanation are shown in Fig 4. In order to create a powerful marketing plan the organization is required to understand their customers completely. Hence, customer decision making process theory is a useful tool to analyze the customer through identifying and following the whole process of decision making by the customers. Adequate knowledge of the customers’ decision process allows not only improve the sales but also helps in the creation of an appropriate sales strategy. Despite the fact that this tool has now been modified and has now become more developed due to the process of digitalization, it allows to provide the basic knowledge of customers. 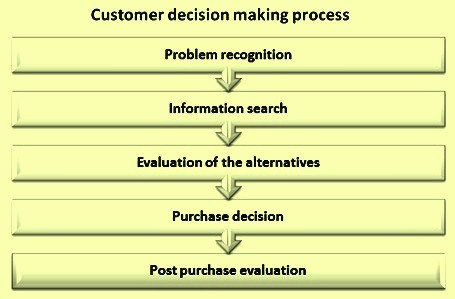 The customer decision making process (Fig 5) consists of five parts namely (i) problem recognition, (ii) information search, (iii) evaluation of alternatives, (iv) purchase decision, and (v) post purchase evaluation. The first part ‘problem recognition’ is the most important step in this process. Purchase always happens after the potential customers recognized his need. The need recognition can be caused by physiological reasons or psychological reasons. At this step, determination of period, when target group needs a lot, assist to create the advertisement or promotional plan at the ideal time. ‘Information search’ presents the searching stage, when customer is willing to find the best choice through evaluation and identification of the available information. ‘Evaluation of the alternatives’ step is about the time, when customer starts to look for the best deal. Customer is usually guided by his attitude towards the product, its price and quality and other factors, which are considered to be important. At the stage of purchase decision, the customer makes the decision to purchase a particular product. At this step, customer has evaluated all possibilities and came to the conclusion and the final purchase decision is mostly based on the evaluation he has made for the available products. In the step of post purchase evaluation, the customer evaluates the level of product satisfaction and analyses if his expectations are met. Post purchase evaluation is an important stage for the organization since the customer satisfaction leads to the strong brand loyalty, while dissatisfaction creates a bad image of the product, and company loses potential future customers. A sales plan denotes the organizational strategy for the sales targets, methods of its achievement and available resources. The sale planning is an important process for the organization since it puts everything in a clear order and allows understanding of future financial status. The process of the sales planning is based on the previous years’ data and statistics which include sales volume, customers’ habits, marketing strategies, pricing policies and market changes etc. In addition to these, the organization is required to understand target groups in order to forecast the number of customers, their visits and calls/contacts. Further, sales plan needs careful resource planning which includes wages, sales personnel, sales cost, equipment, and promotional expenses. Also, the sales plan is to match with the production capacity. It is also to include the improvement strategy for the sales people skills, product and market knowledge. In addition, a number of leads, which are required for achieving the forecast growth, are also to be considered. After preparation of sales plan, sales budget needs to be worked. Sales budget is a summary of the sales plan. Normally three types of the sales budget are prepared. These three types are (i) optimistic, (ii) realistic, and (iii) pessimistic. Preparation of three different sales budgets gives more flexibility to the changing environment. Sales plan and budget are required to be revised on the semi-annual or annual basis to gain efficiency and to correct mistakes. Apart from this, organization is to be aware of sales cycle length as it can influence the cash flow. As an example, sales cycle can extend if the organization introduces new product to the market, and customers need more time to take a purchase decision. The complete sales planning process requires monitoring and progress driving in weekly or monthly meetings of the sales team.